I deem it important in illustrating how Allah can Guide someone, however undeserving of Guidance they feel they are. So here is my story in short (thus far). My journey to Islam I cannot describe as something which occurred over the months in which I began to learn about it, in fact, it was towards the end of my primary school years, going into secondary school, that I had my first big life change. I was born into a Christian family, but as the years went by my parents drifted from the Church as they did not agree with the culture of the Church (to the best of my knowledge). At this point I had no intentions to pursue my studies nor any inclination towards changing that. However, the night before I went to the first day of secondary school I had a dream. This dream I remember clearly even today, because it was a dream that in my view changed the course of my life. The dream told me if I were to remain with my current friends, and continue with my current habits, I would go down a path that would end in suffering. The next morning, walking to secondary school with my older brother, a group of older boys walked past smoking and yelling, at which point the dream burst back into my mind. I made a firm resolve at that point to change myself; my behaviour, my attitude to learning. So that’s what I did, and over the course of secondary school I changed myself around, I became completely dedicated to learning. Unfortunately there were struggles, I had lost all of my friends, and throughout secondary school, although I made many good friends after this, I never felt as if I belonged. I could see so many things in the society I was growing up in that I could not agree with. A lack of compassion for others, a disinterest in making the world a better place, being obsessed with worldly things, and most importantly, not sharing this voice. I had had it as long as I can remember, something calling me to itself, never an internal voice, something much greater (this was most certainly the thing which led me to becoming very involved in astronomy, that same feeling looking at the night sky). Although I never defined that voice, I knew it was God and I knew He was guiding me in some way. At this point I had asked my parents if I could be baptised, as this was the only connection to God I knew at the time, this Western prevalent faith. I had never been baptised at birth, the vicar had said he could not baptise me at the time, for which reason I do not know, and so I was never a Christian by definition. Alas, this endeavour came to nought and I was again not attached to any organised religion. After secondary school I went to a joint sixth form. This is when class fellows began consuming alcohol, parties and drinking were societal norms and everyone was expected to indulge in it. Girlfriends, boyfriends, suddenly there were all these things that people were expected to do. Having been invited to parties and following the social trend I attempted to join in, but there was this part of me in agony on the inside, none of it felt right. And one day I got this desire inside of me to not consume any alcohol, even though every person I knew; friends, family, elders and youth partook in it. I made a firm resolve to go against this trend because I knew God did not want me to do it (and this was before I knew anything whatsoever about Islam, and was not acquainted well enough with Christianity’s teachings to know they also did not permit it to a certain degree as well). Social exclusion once again began to take place, I no longer could socialise with friends due to the centrality of alcohol, when drinks where offered to cousins at family gatherings, I always said no. Family friends began to notice it too. I had no reason to not do it, but as I would later find out, Allah is the best of Planners, and bestows His Mercy on people before they are even aware of His plans, just as He gave me that desire to live before I was even born. And then came university, now almost two years ago. All that I disagreed with already in sixth form now became elevated to a whole new level. I began to despair over what was happening to all these people around me, following social norms without questioning what the consequences could be, I began to beg to God to show me, show me the way. I cried many many times during prayers during my first year of university, these actions that I knew were not right were not going away, so I prayed to Him every night to bring me closer to Him, whatever that way was, bring me someone who will guide me on a straight path towards You, because this is becoming unbearable. And just before Easter term I was introduced to Islam. I sat with a group of people and inquired where they had all come from (being foreign students). One of them said they belonged to a faith called Islam Ahmadiyyat. From there my studies of Islam began. I bought books upon books about this religion, as I came to know that this was God answering my prayers. Not much happened at first, except this feeling began to grow that I was in the right place and so I persisted. Throughout the summer I became indulged in Islam and I began praying more and more. One evening I went for a walk on the woodland area near my house in which once again God communicated to me, not through words or vision, but through the language which is most subtle and yet perhaps most powerful in changing someone; the language of the heart. He told me this was right and I was where I needed to be. I had to then move to the next stage, what is Ahamdiyyat? And so I contacted the one who introduced me to Islam as to what Ahamadiyyat meant. 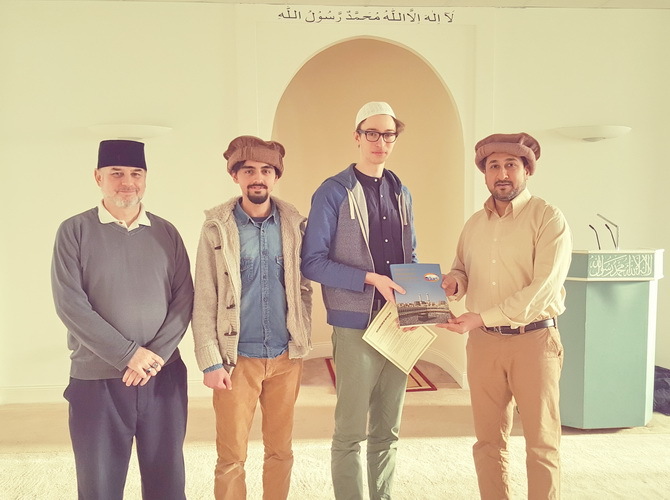 They then forwarded me to the local Jama’at and told me that I should read The Philosphy of the Teachings of Islam by the Promised Messiah (as). My heart was in the right place, but this book, this book introduced me to something that I needed to convert, it had logic and reason, perfect arguments. These arguments not only made sense of ALL religions, but worldly matters and most importantly, it gave reasoning to that voice, that voice I had carried with me since as long as I can remember. There’s no easier way to put it, like the equations I study in my physics degree, this Religious Law he was describing was IT, it was the Truth. Where all others were stumbling around not sure of the purpose of life, he had answered it, so simple and so elegant, ‘To worship Allah’. This reminds me of a quote by the PM (as) which goes something like this; ‘It’s as if they’ve lost something, the name of which they’ve forgotten and they’re desperately trying to search for it in everything but IT itself’. And it was a Archimede’s Eureka moment, that moment when you put down the book and you can’t help but shake your head in disbelief, EVERY single problem and issue I had was being answered by this man who claimed to be the Promised Reformer of the latter days. I read the words of an honest man who deeply cared about finding God and developing love for The Holy Prophet (saw). Most importantly, unlike all other religions, God was not dead, He was living and was in communion with each and every one of us; when other religions were not convinced I was being guided, Islam said it was to be EXPECTED. Alex being presented with a gift by Farhan Ali, Hartlepool Tabligh Secretary, after completing his Bai’at. Mr Harris Choudhry (second from left) brought him to the Mosque and Jalsa Salana. At this point I was invited to Jalsa Salana, an event which brought me the next step towards Islam Ahamadiyyat; community and the blessings of Caliphate. I saw unity and brotherhood. I saw strength, consistency and truth. I saw agreement under one leader and I felt something I had never experienced, I felt Divine guidance of not just an individual but of a whole community. Huzoor (may Allah be his helper) carried every individual in the community. At the time it had not fully dawned on me the importance of Caliphate, but for the first time I had witnessed it in all its glory. And then dreams started appearing, odd things started happening. I would pray for things and they started being answered. I learned of those experiences people had had within the community. Not the odd experience, but everyone seemed to have a story to tell. Sadly, when university started up again, all that time I had been spending on Islam suddenly stopped, and I felt a darkness for the first time since I started looking into Islam. So I prostrated before Allah and asked Him to tell me what to do. That night, or perhaps the one after I had a dream where I was walking with Huzoor, and he told me that I needed to read Revelation Rationality Knowledge and Truth by the fourth Caliph (may Allah bless his soul). And so I did, and sure enough it got me right back on track. One thing that began to sadden me during this time was that worldly things that I had once found great comfort in became empty, I no longer found the value or fulfilment I once got from them. However, by the Grace of Allah, this turned out to be a door that led me even closer to Him. The void that had appeared I had a desire to fill it with Allah. As strange as this may be, only at this stage did I decide to learn about the life of Muhammad (saw). Prior to this I had developed huge respect for him having spread this beautiful religion and that Allah had revealed His Message to him. Now, however, I wanted to learn about his life. The more I learnt, the more I came to know him, the more I saw how much the Promised Messiah (as) loved him, the more I began to feel this love for him. This man I never knew was reaching through time with the message God had given him and was guiding my life, improving my morals and teaching me the purpose of life. I began to love him more than I had loved anyone. Muhammad (saw) showed me through his example how I was going to get closer to Allah, and he spoke a truth that was undeniable, and most importantly, it became a reality. I put his teachings into practise and read the Quran and Alhamdolilah I felt this rapid movement towards that voice that young boy once knew. I had found that voice that had kept me safe from things which I didn’t even know were wrong before I had even found His teachings. Allah is not bound by time, and because He got me here, I then knew I could trust Him with my whole life. He had shown to me that He knew better than me. He was my oldest, closest and most subtle Friend and He had guided me to Islam Ahamadiyyat. And on the 14th of January I had converted, and each day passes and I am finding more and more blessings in this religion, and pray that I can do my part for the community and spread the message of Islam Ahamiyyat to the world. JazakAllah for your time.